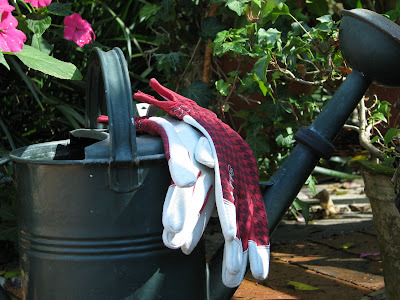 It might be surprising to know that a really good pair of gardening gloves is not all that easy to come by. At least that has been my experience. I consider myself somewhat of a good test case being that I wear out a pair just about every 3 months or so. It's always that middle finger on the right hand that gets a hole in it first (and sometimes long before the rest of the glove is worn) followed by a seam or two giving way between my thumb and forefinger. 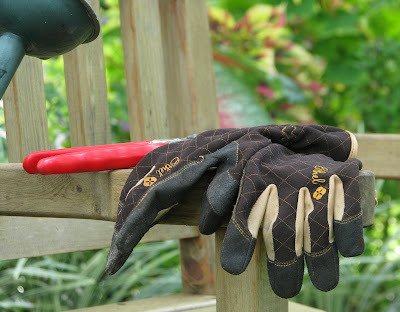 Over the years I've tried all manner of gloves from the cheapie styles found in the big box stores to the expensive brands ordered on the gardening Internet sites. Finding a quality glove is a thing I consider essential to my gardening experience. As a gardener living in a climate that allows me to garden all year long, let's just say, my gloves are used a lot. Last summer Ethel gloves contacted me and offered to send me a free pair for me to try out. I have to tell you, my first impression was favorable. I LOVED their website and their product packaging was impressive as well. In the scheme of things neither of those factors would matter one wit if the gloves weren't effective. But, in my book, good marketing along with a product to back it up is worth noting. Slipping my fingers into Ethel's lightweight signature style glove, to give them their first workout, immediately I had the inkling I was going to like them. They are pretty, too. So chic. Again I prefer pretty, and I'm not ashamed to admit it, but not necessarily over function (in this case anyway). So off we go to check out "function." For years I didn't wear gloves. Much like for years I didn't wear sunscreen. Both my hands and my skin are telling the tale these days. I still find myself digging up a weed, pinching off a dead bloom, squeezing the life out of a grasshopper or leaf-eating worm with my bare hands when strolling through the garden. When I come inside with dirty fingernails and tomato plant stains (man, that stuff is hard to get off) on my fingers I remember that I forgot--- ha --- remember that I forgot... these things happen with age I'm told. Oh, and of course, I never sow seeds with gloves on. How does anyone do that? These Ethel gloves have seen some serious gardening. They've assisted with digging, planting, pruning, sawing, mowing, edging, weed pulling, sweeping, mulch spreading, worm digging, power trimming, and everything in between. They've been soaked with muddy dirt, rinsed and hung to dry; they've also been properly washed with mild detergent several times. They do all of this without getting stiff or shrinking ... or ... important to note here... without losing their prettiness. All important factors. Honestly, they've lasted much longer than any other glove I've ever used. That's saying a lot! And honestly, I like them more than any other glove I've ever worn. That's saying a lot. I've bought a few pair as gifts for other gardeners because I recommend them so highly and love to share what I find to be useful. So a month or so ago I ordered a second pair for myself. This time I chose the style "expression" because ... have I ever mentioned how much I love red? They are well used now but they clean up nicely. Just when I was on the verge of placing an order for another pair (stocking up for spring) I saw that Kylee was having a give-away for a free pair last week (or was it the week before?). I put off placing that order ---just in case I happened to win. Alas, it was not meant to be. But congratulations, Victoria. If you are in the market for a fabulous and fashionable glove at a very reasonable price and no shipping charges Kylee is offering a 10% discount with a code you can use from her blog post if you go here. 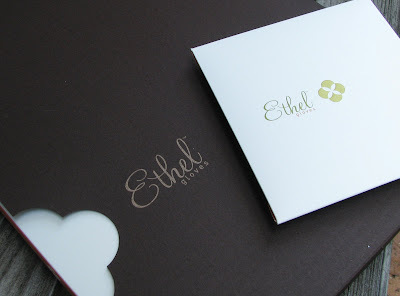 BUT if you order today, the Ethel website is offering a 15% discount (through today) because it is their way of celebrating their own very Happy Birthday. 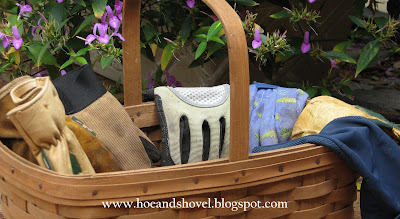 note: Hoe and Shovel gets no kick backs or discounts aside from the initial pair of gloves given to trial. hmmmm...is right. Thanks for the edit check. I went back and clarified (I hope). So much for being in a hurry to finish a post and get back out to the garden. I 'm like you.It is just recently that I've made myself wear gloves.And I forget,too. Sometimes,I just intend to wander thru the yard and JUST look(yeah right! ).I must check out those gloves.Thanks for the info. I've never heard of them. I'll give the site a look-see. This time of year when I'm doing a lot of rose pruning I need heavy leather gauntlets that protect the front and back of the hand and arm. Later I want very light weight gloves that will pull a blade of grass but prevent slivers, thorns or glass from cutting me. Speaking of glass, what was with the farmers who lived here before me? I find more broken glass and crockery in my flower beds;) And old, old nails. I always try to remember to grab my gloves and pruners before that walk about but if I don't... in go the bare hands. I don't suspect these gloves would work for the heavy pair you need for your roses. But for that lightweight everyday pair these are my choice. When I was visiting someone in Savannah GA last year they mentioned finding glass and pottery in their garden and said it was from civil war days. Not sure exactly why but something about the north pillaging and spoiling all their goods. Ethel Gloves look incredible, Meems. I have a hard time wearing gloves at all, especially when I'm digging around in the dirt. I have had several different pairs --and always wear them when I rake or do things like that. I cannot stand to get 'stuff' under my fingernails---so I do NEED to wear gloves all of the time. I do wear them when I weed... SO--I may check out the Ethel Gloves. Hi Meems, There is nothing like a great pair of gloves! These are styling, too. This time of year my hands and nails are permanently discolored even with gloves! It's probably the inexpensive gloves I wear or the fact that I take them off and forget to put them back on! I lose gloves all the time. I was intrigued by these gloves earlier and it might be time to give them a better look. It's so delightful that we can garden again up here! Hi Meems......I was so glad to read that you prefer not to wear gloves....me to.....and like you the skin on my hands as suffered....but hey, I love gardening and my hands show that I do!! Meems I buy gloves but I forget to wear them. I use the fingers out type to mow the lawn to prevent the callouses. Imagine shaking hands all dolled up with calloused hands, or dirty fingernails, those just don't go together. 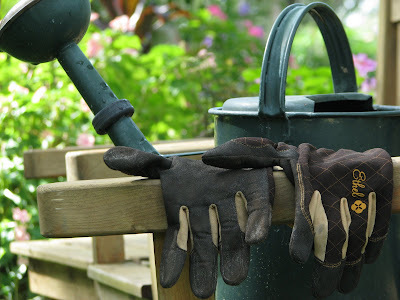 However gloves are not only protection from callouses and dirty nails, they prevent the contraction of deadly disease Leptospirosis that can be very easily transmitted via gardening. I really need to start wearing them. I go through so many gloves, I like hearing these testimonials. 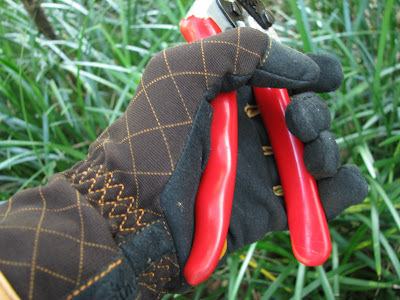 I've decided that I run through gloves from weeding, not from planting, pruning or pulling. No, I don't wear when seed-sowing as I put seeds in my bare palm when I'm being meticulous (when I'm going wild, I just toss the seeds!). I'd never heard of these either until I saw them on Our Little Acre recently. I go through gloves really quickly too, I'm going to check these out. I'm a bare handed seed sower too! well, poo, as usual i am on line very late in the day, or should i say early in the morning, and i would have liked to order the gloves with the 15% discount. guess i missed that one day special! i really need a good pair that will last, as like you, my middle finger, right hand, is always worn thru. i do admit to buying those cotton ones at the nursery with the little bumps on the fingers because i like them to be cool (as in not hot on my hands) and lightweight, so they are very flexible. of course, if i got a good pair they would last me much longer than 3 months, as i don't do much but weed with them on, but i do wear them anytime i am digging around in my little garden. Meems, you should write advertisements! And Ethel Gloves should be most grateful for your testimonial. Truly, if a trusted blog friend tells me they like something then I'm anxious to try it. I've seen these gloves for the first time recently on Kylee's blog, and a couple of others, and definitely want to give them a try. Like so many other gardeners, I take my gloves off...and put them on again...lose them sometimes, and don't use them when sowing seeds. I'm one of the lucky recipients of Meems's glove-gifting, and I must agree... they're fantastic! My pair has a lovely raised floral texture on the palm-side thumb and forefinger, which comes in handy when pinching the life out of aphids or coddling the smallest of transplants. Thanks Meems!! PS Thank you so much for the hugs and encouraging words about spring coming to my cold garden. I'm much in need of a warm blast of something! Your words fit the bill. egultGorgeous pictures,I sell many of these plants at my store. I have a pair. The blue ones. And they are indeed wonderful. I just forget to wear gloves! I really enjoyed reading this post...got sucked in and was on the edge of my seat (literally) to see if you liked the trial gloves. And how cool that they sent them to you for free to test them out.